It has returned. A little rounder and more peanut buttery than ever. But at what cost? Going into this particular Saturday I hadn't planned what I was going to bake, whereas I would usually have that figured out by Tuesday/Wednesday. Granted, it was my first week back to work so come Saturday I was a little blah. I was also in a bit of a plane jane mood. I think all the sweets I had over my vacation had finally gotten to me, and I was a little burned out. I wanted something that wasn't so intense with “dessert” flavour. I searched and searched but everything I was interested in required room temperature butter or eggs. Then, as if compelled by some mystical force, I locked eyes on my baby. Quickly I discovered that I can't even leave my own recipes alone as I started to play around with the ingredient amounts. One of the comments I made originally was that the cake's day one flavour didn't have as much peanut butter taste as I had hoped. I felt compelled to try and remedy this. I decreased the sugar and subsequently decreased the amount of milk, I was worried that with less sugar the batter would be a little loose. But my most thrilling change? There would now be a full cup of peanut butter :). Once again because of the recipe's simplicity it came together in a flash. I decided to use a round pan this time so the pieces would be a little more even, since the cake rises relatively high. As the cake baked the house was filled with a wonderful peanut butter aroma. This was new. This was exciting. I could only hope that the flavour matched. I cut my first piece later that night and hoped for the best. The initial peanut butter flavour that I longed for originally was finally there. The experiment had worked... almost. As with last time the cake was very light and fluffy, but it seems that with the extra peanut butter and the reduction of milk it wasn't as moist. I don't want to say dry, but it definitely gave that “got milk?” feeling. Is this a bad thing? I'm not sure. I seemed to be the only one to make the comment. But the flavour was there so the mission was at least a partial success. The cake is still great but I leave this experiment conflicted. On one hand it has a better peanut butter flavour, on the other hand it was a little drier. The only solution might be to bake both recipes side by side and see which is better, perhaps with the milk at its original amount. Oh, but my, what a terrible thought. What ever would I do with two peanut butter cakes? Preheat oven to 350F. Grease an 8" round (or square) cake pan and line the bottom with parchment paper. In a medium size bowl add brown sugar and eggs and stir together until thoroughly combined, it will be very thick. Add milk and stir until completely combined. Add peanut butter and stir until even and smooth (peanut butter will clump when first added). Add dry ingredients to wet and stir until just combined. Do not over mix, you want the batter to have lumps in it, so keep a soft touch. 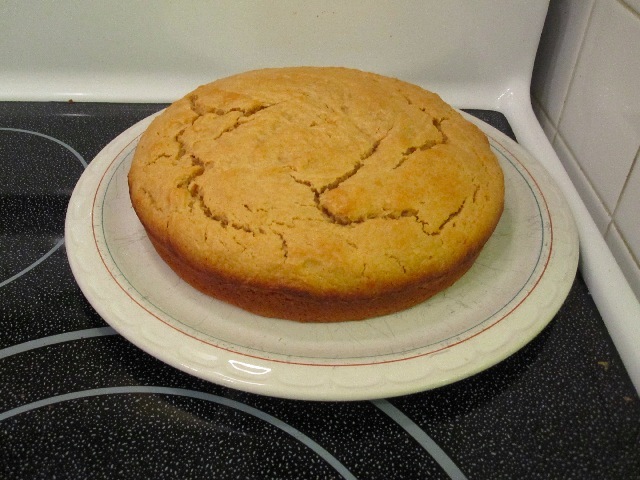 Pour batter into prepared pan and bake for 30-35 minutes or until toothpick comes out clean (depending on your oven you may want to check between 25-30 minutes, my cake took 30). Allow to cool in pan on rack for 10 minutes before removing and cooling completely.